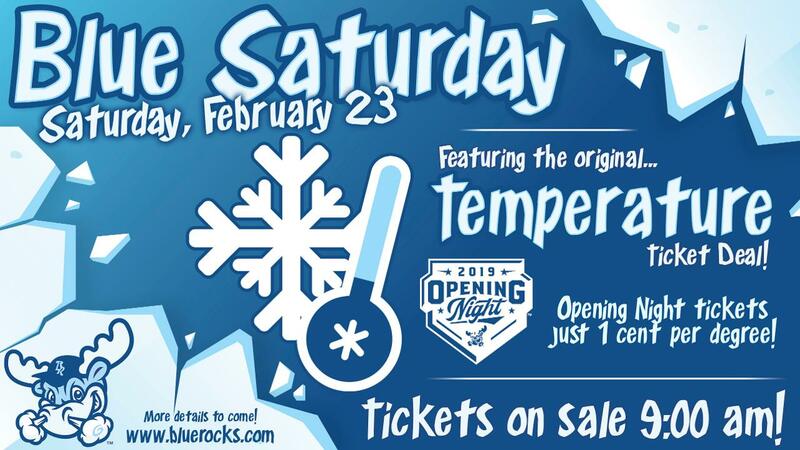 Wilmington, DE-- The Wilmington Blue Rocks announced on Thursday that individual tickets for the team's 2019 season will go on sale Saturday, February 23 during the Blue Saturday Ticket Extravaganza at Frawley Stadium. The organization moved the event from Presidents' Day to a weekend date after receiving multiple requests from its fans. "We received a great deal of feedback from our fans that they would prefer this to be on a Saturday," said Blue Rocks director of tickets Joe McCarthy. "They all told us how much they loved the event, but most explained how much more convenient a weekend would be. As an organization, our chief responsibility is to make our fans happy, so we eagerly adjusted the calendar." The event may have a new date, but it will keep its most popular characteristic--the team's annual temperature ticket price promotion. Prices for Opening Night tickets will be dictated by that morning's temperature. It will be one cent per degree, so if it is 26 degrees, Opening Night tickets during Blue Saturday will be just 26 cents. The Blue Rocks have plenty more in store for their fans and will release a full slate of fun and specials available on Blue Saturday in the coming weeks, so stay tuned to BlueRocks.com for more information. The Blue Crew open their 2019 season at home on Thursday, April 4 against the Salem Red Sox. The organization will release its promotional schedule next month. Season seats, mini plans and group packages for the upcoming campaign are available now at BlueRocks.com.